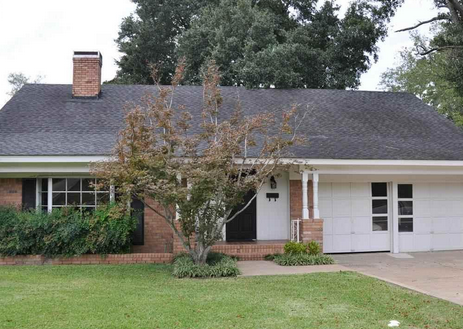 If you go to the link given in the title, you will see a beautiful house for sale in Henderson, Texas, a city in the far eastern part of the state just west of the Louisiana border. The building is a brick veneer house that is built in the “traditional” style and has four bedrooms and two bathrooms. It is a very beautiful house and there is a young tree just in front of it. A chain link fence surrounds the perimeter of the property, which has both security and landscape lighting. There is one garage in front with space for two cars, a small red storage building shaped built in the form of a barn and a vinyl-lined in-ground swimming pool. A patio with built-in seating is shaded by a nearby tree and is raised above the ground. Inside it is just as beautiful as out. This house has a central cooling system as well as a wood-burning see-through fireplace. The flooring in various parts of the building is made of wood, vinyl and parquet (pieces of wood assembled together in mosaic fashion for decorative purposes). There are two dining areas: a separate one for formal dining and a less formal den for when greater intimacy is desired. In addition, the house has a family room and three living areas. Next to the fireplace is a white sofa with orange floral decorations just beneath a simple double-paned window that offers a magnificent view of the outside. The walls are plain golden yellow. In another place there is a bay window that reaches to the floor. The railing to the stairs is thin and white with a diamond shape on every third bar. 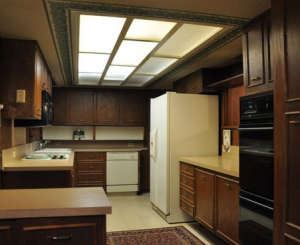 The kitchen is equipped with a double oven, a dishwasher, a disposal, a microwave oven and a pantry. Other interior features include a ceiling fan, a smoke alarm, blinds and cable TV. It would be hard to think of a better place to raise one’s children. Within walking distance of the house on 500 College Avenue is Fair Park, which has been recently renovated and includes a playground, a jogging trail, a children’s water park, a skateboard park and a covered pavilion where the whole family can go to have a picnic. Somewhat farther away, and much smaller, are Smith Park and Montgomery Park, of which the latter also has a picnic pavilion and a playground as well as a place for baseball practice. Businesses located within the neighborhood of College Avenue include Fish & Still Equipment, Inc., Farmers Insurance and Howard Dickerson House Museum, which dates to 1855 and is the first brick house erected in the county.